Email logs provide detailed, configurable and searchable information about email activity regarding time, sender recipient, subject and spam status. 1. Go to Reports > Logs > Email. • Sender — Select to display who sent the email message(s). • Recipient — Select to display who the email message(s) are for. • Subject — Select to display to display the subject line of the email message(s). • Spam — Select to display information about message(s) that have been classified as spam. 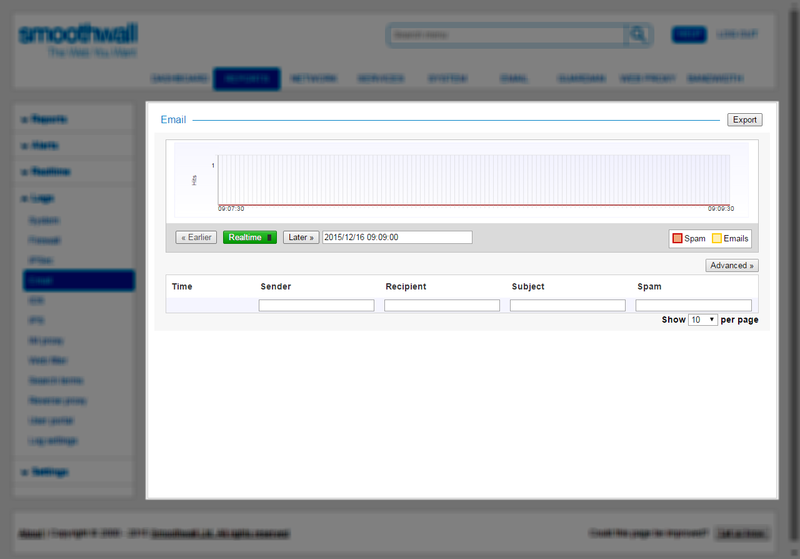 It is possible to monitor email log activity in real-time. 2. From the Email panel, click Realtime. 3. To stop real-time monitoring, click Realtime. The Smoothwall enables you to search for/filter information in a number of ways. • Time — Click in the date and time picker and specify when to search from. Click Apply. The Smoothwall displays the results from the time specified and two hours forward. • Free search term — In the Sender, Recipient, Subject or Spam columns, enter one or more search terms. The Smoothwall displays the search results. 1. On the Reports > Logs > Email page, configure or search for the data you want export. For more information, see Viewing Email Logs and Searching for/Filtering Email Log Information Information.